City Council recently authorized staff to seek an appraisal for more than 300 acres in the Eldorado Valley so the area can continue to be occupied. (Boulder City) City Council approved staff seeking an appraisal for more than 300 acres of land in the Eldorado Valley. The appraisal is needed because the current right-of-way grant expires in August. The 384 acres house the Eldorado substation and substation expansion west of Copper Mountain Solar 1. According to Brok Armantrout, Boulder City’s contracts/real estate manager, the site received its initial easement in 1969 through a right-of-way grant from the Bureau of Land Management. 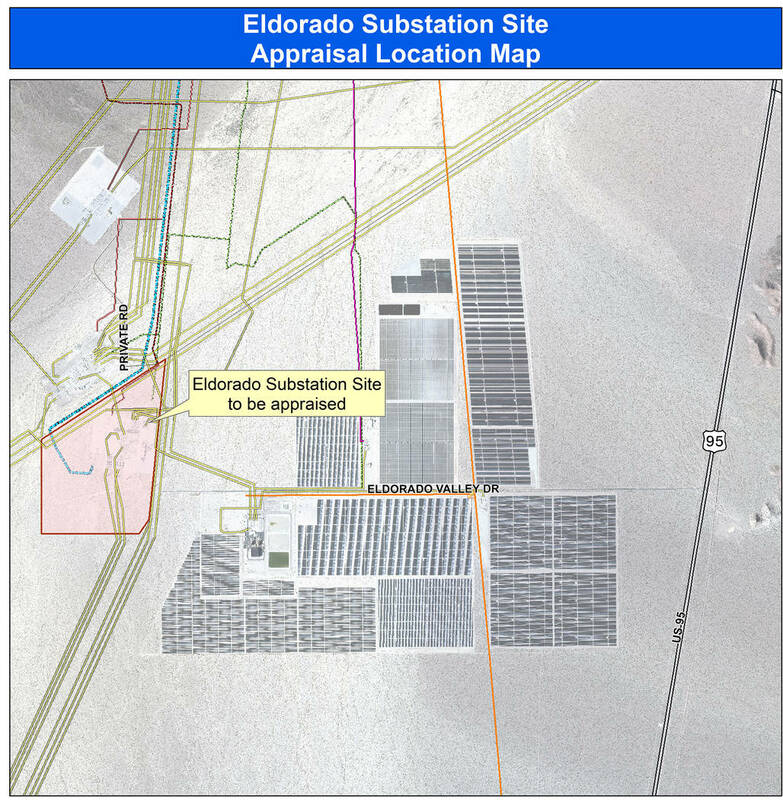 That grant expires in August and the operator, a consortium of Salt River Project, NV Energy and Southern California Edison, must obtain a lease from the city to continue occupying the land. Armantrout said the land needs to be appraised for that to happen, and he needed council to authorize it. The cost of the appraisal will be recovered once the land is leased. Council unanimously approved the directive. Also at Tuesday’s meeting, Utilities Director Dennis Porter presented information about the city’s water, wastewater, electric and waste management utilities. He said the city owns and operates the four municipal not-for-profit utilities created by its charter. For each utility except waste management, Porter said a master plan is needed in order to properly assess future needs, reliability and redundancy. Maintenance plans for each of those utilities also have been started. While the city owns the landfill, it is regulated by the Nevada Southern Health District. BC Waste Free handles the waste management aspect, and the landfill has a projected life of 100 years. Councilman Kiernan McManus told Porter he was concerned about the increase in utility services fees over the past few years and they could be a financial burden for people on a fixed income. “You can’t conserve your way out of those. … If people want to conserve and need to conserve, I’d like to give them a way to do that,” McManus said. According to Porter, the electric service charge was $5 in 2016 and increased to $10 in 2017. He said it is projected to stay that amount through 2020. Residents who opted out of having a new electric meter in 2018 pay a $25 a month service charge. Water service fees for a 5/8-inch-to-1-inch meter that serve single family residential homes were $18.34 in 2016, $25.50 in 2017, $32.10 in 2018 and $37.56 in 2019. Porter said those fees include a $12.84 infrastructure and drought surcharge from the Southern Nevada Water Authority. “If you went to Henderson, you’d see it as a separate line item,” he added. McManus also told Porter that he would like updates about the city’s utility projects posted on the city’s website. “We need to do a better job of … explaining to the public what we are working on,” he said. Councilwoman Peggy Leavitt agreed with McManus. Mayor Rod Woodbury agreed that it was a great presentation and good to see what the city is working on. Council also approved giving money from the Community Development Block Grant program to Emergency Aid of Boulder City and Lend A Hand of Boulder City. Both nonprofits have been receiving the grant for more than 20 years. This year Emergency Aid applied for $25,521 and Lend A Hand applied for $8,967, which they received.